The Right Word: Roget and His Thesaurus | What is ML Reading? Since elementary school, I’ve been a “Thesaurus Junkie.” I use an online thesaurus when writing my posts. Santa filled my stocking with a pocket thesaurus last Christmas. I keep it by my bed… sometimes reading it instead of a book before bed. Ecstatic is one word describing my feelings when The Right Word: Roget and His Thesaurus by Jen Bryant and illustrated by Melissa Sweet arrived. Thrilled, overjoyed, elated, delighted, exultant, jubilant and pleasantly surprised to read a book explaining how my favorite book metamorphosed describes my glee. The fact it was in my favorite book format… a picture book made it even sweeter. Speaking of sweet. One of my favorite illustrators, Melissa Sweet, created the art for this book using watercolor, collage and mixed media. Her detailed illustrations are whimsical, lively, fanciful, entertaining, magical, imaginative, amusing, engaging and fun. To my knowledge, ML has yet to use a thesaurus. Last year, ML asked Santa for a dictionary. I am hoping Jolly Old Saint Nick will bring her a “treasure house” this year. 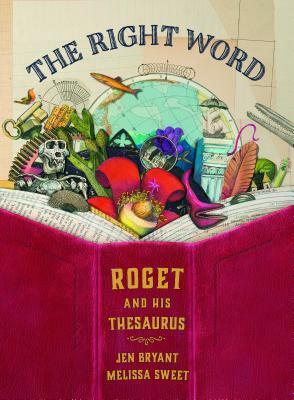 This entry was posted in Nonfiction Book and tagged Jen Bryant, Melissa Sweet, The Right Word: Roget and His Thesaurus by mlreads. Bookmark the permalink.